Mercury will be in a close conjunction with Mars on Friday February 8, low in the southwestern sky just after sunset. Despite being among the brightest objects in the sky, Mercury is a planet very rarely seen by even experienced stargazers. The next couple of weeks offer the best opportunity in 2013 for observers in the Northern Hemisphere to spot Mercury's tiny speck of light in the evening twilight sky. The trick for spotting Mercury is first to find an observing location with a low unobstructed western horizon, wait for half an hour after sunset for the sky to darken, and then sweep to the left of the sunset with binoculars. Once you've initially located the planet with binoculars, you can usually see Mercury with the unaided eye. Don't wait too late, or Mercury will have set. In a telescope, Mercury appears as a tiny "half moon." Probably the earliest you can spot Mercury will be on Friday night (Feb. 8). This is a special night because Mars will appear very close to Mercury in the sky, giving observers a view of two planets at once. A second opportunity to catch Mercury and Mars will occur three evenings later on Monday (Feb. 11). Though not as close together, the near proximity of a slender crescent moon will make finding the pair easier. Look with binoculars for the "dark side" of the moon illuminated only by Earthshine: sunlight reflected from Earth. A third opportunity to see Mercury occurs on Feb.15, when Mercury is at greatest elongation from the sun. This places Mercury at its highest altitude this month for observers in the Northern Hemisphere. Mars will probably have sunk too far toward the sun to be visible. Why are some apparitions of Mercury better than others? It has to do with the angle between the observer's horizon and the ecliptic, the path that the sun and planets follow across the sky. 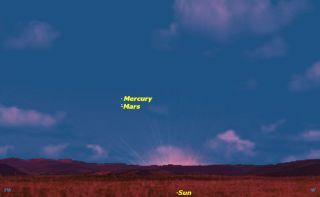 In the Northern Hemisphere, from February through April, the ecliptic at sunset is steeply angled to the horizon, placing Mercury relatively high. From August through October, the ecliptic lies almost parallel with the horizon at sunset, placing Mercury close to the horizon. Take advantage of these opportunities to spot Mercury this month, and you’ll be able to say that you've seen something few astronomers have. The locations of planets Mercury and. Mars at sunset on Feb. 16, 2013, are shown in this NASA sky map.